Earlier this week, I published a new paper on the net neutrality debate in the public sphere with my co-authors Rob Faris, Bruce Etling, Dalia Othman, and Yochai Benkler. 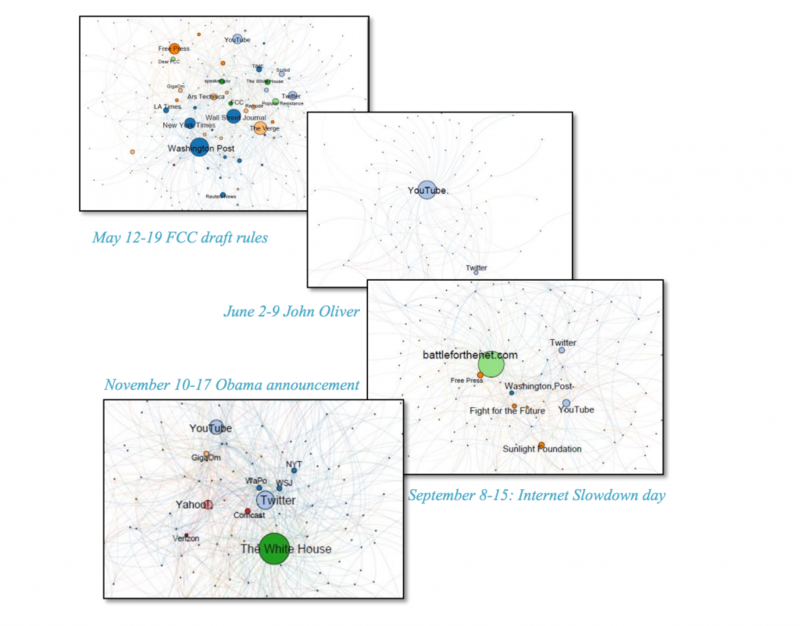 In this paper, we use the Media Cloud Controversy Mapper to identify over 16,000 stories about net neutrality from 2013-12-01 to 2014-11-17. We use that data to perform a variety of types of analysis to explore the networks of language and influence within the controversy. Our core finding is that the networked public sphere played a key role in changing FCC policy on net neutrality. Several key periods of debate during the controversy look a lot like traditional elite agenda setting (court makes a decision reported by national newspapers, FCC insider leaks upcoming ruling to the Wall Street Journal, etc.). But during the key months before Obama’s announcement of support for net neutrality, the dominant modes of agenda setting were a viral video, an online comment campaign, and an internet protest by pro-net neutrality activists. Comments closed — Trackbacks closed RSS 2.0 feed for these comments This entry (permalink) was posted on Thursday, February 12, 2015, at 6:53 pmby hroberts and categorized in surveillance.